Frances O. Kelsey died last week, at the ripe old age of 101. You probably don’t recognize her name, but we are all in her debt for the role she played in events that hark back to the Kennedy era (an odd coincidence, given the subject of my last blog). But to tell the whole story we have to go back even further than that. The 19th century marked the heyday for patent medicines. “Snake Oil” – actually, mineral oil with flavorings – was energetically hawked to the American public, along with innumerable other products of equally dubious origin (see Chapter 14 of my book, “Sense and nonsense in the treatment of ASD,” for more). In 1906, largely in response to public outrage over unsanitary conditions in the meat-packing industry, congress passed the Pure Food and Drugs Act , over the bitter opposition from both the meat-packing and patent medicine lobbies. In the 1930s congress extended its original legislation to create the Food and Drug Administration. One of the FDA’s first measures was to ban radioactive quack medicines, in the wake of the 1932 death of Eben Byers, a wealthy industrialist and socialite who had consumed radium tablets that had been marketed as a health product. (If you find the idea of radium as a health food hard to swallow – no pun intended – I can’t blame you! But that’s the way it was.) Despite that early success, however, the FDA that young Dr. Kelsey joined in 1960 had only a handful of staff, and no statutory authority to require that proposed new drugs be tested for safety before coming to market. One of Kelsey’s first assignments was to review the application for thalidomide, a new drug being promoted to treat morning sickness. On the advice of her staff, and with the support of her superiors within FDA, Kelsey withheld approval, pending additional studies for safety. She held firm, despite pressure from the manufacturer. Within a few months of Kelsey’s ruling, at first a trickle and then a flood of reports poured in from Europe and Canada (where thalidomide was already on the market): Mothers who had taken thalidomide during pregnancy were having babies without arms or legs (“phocomelia”). 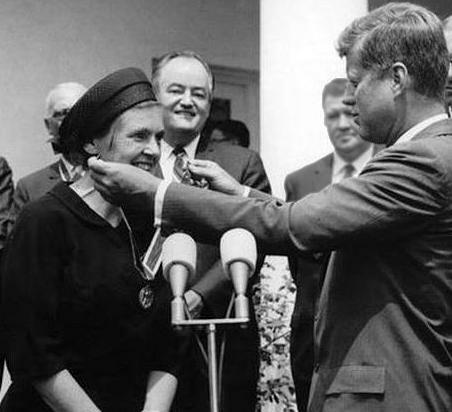 Kelsey was hailed as a hero, and in 1962 President Kennedy awarded her The President’s Award for Civilian Federal Service (here and here). Kelsey remained vigorous and active until shortly before her death a few weeks ago. The link between thalidomide and phocomelia became apparent for three lucky reasons: thalidomide was a new drug, and phocomelia is both rare and immediately obvious. If phocomelia were a common congenital malformation, or if thalidomide were a common and widely used drug, it would have been much harder to pick out the association between the two. And what if the effects of thalidomide had been more subtle – behavioral changes, for example, rather than a physical defect? Or, what if its effects were delayed for decades (for example, increased incidence of cancer or dementia in adulthood)? If any of these had been the case, then the link might not have been recognized. An entire new field of study – “behavioral teratology” is dedicated to unraveling the genetic and environmental influences on behavior, including the impact of drugs and environmental exposures (e.g. PCBs, alcohol, mercury, lead, phthalates…. the list is endless). The challenge of connecting prenatal drug and chemical exposure to postnatal behavioral change is daunting. As in Kelsey’s day, the political, financial, and personal pressure to accelerate approval of new drugs, or to do an end-run around the FDA altogether, remain strong. The seductive lure of bringing unproven treatments to market is often followed by disillusionment or a resounding crash when lack of efficacy, and/or unanticipated side effects emerge. And where behavior is concerned, the placebo effect can produce real changes, even though the treatment itself is useless. (Once again, see my book for more on this). Prior to the 1960s, new drugs did not have to be tested for safety. James Coplan, MD is an Internationally recognized clinician, author, and public speakerin the fields of early child development, early language development and autistic spectrum disorders. Join Dr. Coplan on Facebook and Twitter. Have a question for Dr. Coplan? Ask the doctor.